The college application process is often daunting for students and their parents alike, and needing college application help is expected. For students, the process is understandably stressful and nerve-wracking. This is probably the biggest life milestone they have faced up to this point in their young lives. They’ve worked hard to get to this point, and the college application process often feels like judgment day for their efforts and accomplishments. The competition level for admission to top colleges has also increased substantially over the years. Top university are seeing record numbers of applicants every year, and as a result, acceptance rates are getting lower. The bar for applicants has also risen. Strong academics and test scores or high intelligence are no longer golden tickets into Ivy League universities. Top colleges are looking for extraordinary applicants, and students are feeling every ounce of that pressure. As parents, you want the best for your child. College application time presents a different type of stress for you as you try to find a balance between helping and supporting your child and giving them space to work and process their feelings. Having seen this process up close and connected with countless students and counselors about what has and has not worked, we’ve put together some thoughts for parents looking for college application help on how to survive and ultimately best support your child during application season. This is a big one, and perhaps the hardest one to internalize. If you’re reading this, chances are, you care deeply about your child, their achievements, and their trajectory in life. They’ve probably worked extremely hard throughout their high school career to be a standout. They may be the top of their class, have amazing test scores, and excel in sports, music, clubs, and competitions. You are proud of them, and rightfully so. However, here’s the hard truth to swallow: no one is guaranteed a spot at an Ivy League college no matter how outstanding their academic stats are. Competition at Ivy leagues has only gotten more intense over the years, and each applicant is competing against tens of thousands of applicants, many of whom have equally impressive stats and are perhaps ranked nationally in one of the many areas that colleges care about when considering diversity: math, chemistry, writing, CS, music, visual arts, various sports, etc. Students can certainly optimize their chances through hard work, accomplishments, and compiling that into the best version of their college application, but at the end of the day, there are a myriad of factors that go into an admissions decision; you can’t control all of them. This also trickles down to the rest of the top colleges in the field. Take the top 20 or top 50 ranked schools. The college admissions game has changed drastically even in the past 20 years, and the level of competition has risen across the board. As such, it’s important to understand the realities of the field and set expectations accordingly. That is not to say don’t be hopeful or optimistic. Nor is it saying don’t celebrate your child’s hard work and strive for top schools, but just know that no one is a shoe-in to an Ivy League. And just as importantly, admissions decisions are not singular reflections of your child’s value or their ability to succeed in the future. Believe it or not, your children actually do appreciate your general life wisdom and the lessons your experience has taught you. Choosing a college is a huge decision, and your child will need college application help, starting with deciding which colleges to apply to all the way to committing to a university after acceptance. This is where your insights can be immensely helpful. Help your child be mindful when putting together their list of colleges to apply to. Sit down with your child and talk about what they value in their undergraduate experience and lifestyle. Provide suggestions on lifestyle factors they may want to consider such as location, an urban campus versus a suburban or rural campus, class size, sports, etc. Plan trips to visit the colleges, and try to see as many of their top choices as possible. This will help give them a sense of what life will be like as a student there. Listen to them. This is where they’ll be spending the next four years of their life, and likely, they’ve also done research based on their interests, intended majors, etc. Provide suggestions, but make sure they are heard on their preferences and what they value. And lastly, make sure they have enough matches (colleges where an applicant has a good chance of acceptance) and safeties (colleges where an applicant has an extremely high chance of acceptance) on their application list to balance out the reaches. In my opinion, because of the level of competition from all over the world and the extremely high caliber of applicants, Ivy League colleges should be consider a reach for everyone short of extraordinary, world class achievements like an Olympic gold medal. Again, setting the right expectations is key to a successful and let’s be honest, a sane application process. At least 50% of the college application battle comes down to time management. The college application process is a marathon juggling act, one in which you’re balancing many moving parts of the application, standardized testing schedules, college timelines, and everyday life. The best thing you can do here is to help them get organized early and manage deadlines as a family. Find a good college checklist and timeline. Print it out and tack it on to your fridge. Talk about it as a family and work together to stay on track. By splitting up the work across many months, your child can focus on the quality of each section of the application versus scrambling last minute for a deadline. It also highlights areas and months where you can step in and provide college application help, whether that’s by managing deadlines for signing up for the SATs or carving more time out of your schedule to help proofread and review essay drafts. If you’re looking for a college checklist, here is a month-by-month breakdown we’ve put together with commentary from Ivy League interviewers and alums. There are two frequent misconceptions that we see that I want to cover today. The first is around standardized tests. Standardized test score are important. 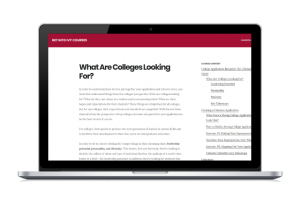 Along with other stats, they give college a baseline lens with which to look at applicants. That said, they provide only a baseline. Being within the range of standardized test scores for a college, especially an Ivy League college, is important, and you should certainly encourage your child to take the test multiple times as needed to get within that range. But, once an applicant is within that median-75% range, extra points don’t really give their application a boost. For example, if your child has a 1520 SAT score, another 50-80 points will not impact their application decision. Spending more time studying for or retaking the SATs is just wasted time. However, if your child’s scores are on the lowest end of the range for a selective school or not within range, raising your score can strengthen your application. Take the time to go through practice tests, go to a prep course, or hire a tutor if needed. You can increase your score significantly in a short period of time with hard work, practice, and the right testing methods. Parents, you can provide college application help here by making sure they’re prioritizing their time the right way. The second misconception is around the importance of academic stats versus extracurricular activities. I want to reiterate that GPAs and test scores are crucial parts of an application. Not being within a school’s range of scores or GPA significantly reduces an applicant’s chance of admission. However, GPA and scores alone will not get an applicant into a top college. Extracurriculars are what set applications apart. The extra time spent putting together that fundraiser for a non-profit, the planning meetings for recruiting more club members, the hours spent writing and growing a blog, these are the things that not only grow and hone your child’s passions in life, but also strengthen their college applications to top schools! This is a big one. College is expensive. And most families can’t afford to pay out of pocket. You’re not alone, nor is this an insurmountable barrier to a good college education. College application help isn’t limited to the application itself. There are a few things you can do here to help your child’s college dreams. Many universities offer financial aid to students based on their family income situation. Private universities tend to have larger institutional grants to help cover the financial needs of admitted students. Help your child research colleges’ financial aid policy early. Many top colleges like Harvard, Yale, Princeton, and MIT offer generous aid based on total cost of attendance including tuition, room and board, books, and living expenses. The Free Application for Federal Student Aid is used by federal and state governments and colleges to determine eligibility for need-based financial aid. Work with your child to file the FAFSA. This may be a situation where the early bird does get the worm. An Edvisors.com study found that filing early has advantages–students who filed for aid in the first 3 months received more than double the grant money compared to those filing later. For colleges that offer less financial aid or if you’re in a situation where institutional and governmental aid will likely still leave a gap, work out a plan with your child early. Teach them about financial planning and calculate estimates for out of pocket cost per year. Spend time researching student loans together and make sure they understand how loans work. Do some math around expected salary out of college and how long it’ll take to pay the loans off. This will help your family develop a plan early and understand the tradeoffs and costs for different colleges. There are numerous outside scholarships that can help fill the gap that you calculated during the financial planning exercises — corporations, regional groups, and service clubs offer a wide spectrum of scholarships based on merit, ethnicity, service record, etc. These scholarships range from a few hundred dollars to $50,000 plus. While managing regular classes and activities and college applications is already stressful and time consuming, taking the time to apply to outside scholarships is worth the time – a few hours or days spent putting together scholarship essays and applications can leads to tens of thousands of dollars in scholarship money. Work with your child and encourage them to apply to scholarships. Here are a couple of our favorites: Coca Cola Scholars Program, Burger King Scholars. You can find more scholarships here. This is another big ticket item. College applications generally call for a stressful, hectic, and emotionally charged year. During this time, it’s important to maintain morale and support your child emotionally in addition to providing college application help. Emotional health and feeling supported will help them have a more effective and productive year in school and for their applications, but more importantly, it’ll maintain the health of your relationship with them. Even admission to a safety school is a win! And you should celebrate accordingly. Even if it’s just a (non-alcoholic) toast during family dinner, celebrating even “small wins” will make application/admissions season less painful and a little more sane. You should also remember that your child’s safety school may be someone else’s match or reach school. That means your child got into a school where others didn’t. It is an accomplishment, and it’s one that deserves some recognition. Your child is likely anxious about their applications and admissions decisions, and you are too. That’s natural. That said, there is still life outside of college applications, and as we talked about before, the admissions decisions are by no means the only indicators for future success. Schedule time to look over checklists and deadlines to stay on track during college applications, but outside of that, take your child’s lead on this. If they want to talk about it, let them ask you questions, solicit advice, or just vent. Otherwise, take their mind off of it and talk about other things. It’ll ultimately help everyone to maintain normalcy during the process. Chances are, your child is thinking about it plenty on their own. You’re likely just as nervous and invested in college admissions decisions as your child. But, this is their day. Ask them if they’d like for you to be present when they check college decisions but don’t pressure them. Some students may want their support system with them when they refresh that decision page. Others may prefer to deal with the moment alone. Respect their feelings, and remember it’s not a reflection of how close they feel to you. Regardless of your child’s merit and stats, likely not every decision will come out their way. I want to reiterate that college admissions decisions are NOT a reflection of a person’s value and certainly not the only indicator of future success. Many people graduating from lower ranked school go on to extremely successful careers and fulfilling personal lives. That said, receiving that rejection letter will still hurt, especially if it came from a top choice school. It’s OK to grieve – let your child know you’re there to support them and listen. If they want to talk, let them vent and express their disappointment. Remind them that the college experience is what they make it, and talk about other schools that they are excited about. If they want space, give it to them. People grieve in different ways, and the loss of a dream will be a big blow that takes time to recover from. The bottom line is, they’re likely already taking this extremely hard and feeling disappointed in themselves. They need you to support them through this so they can pick themselves back up. The college application process is an exciting and stressful time for our students and parents alike. By considering the above suggestions, you can minimize some of the stress and uncertainty in the process and support your child in achieving their college dreams.